The All Blacks have become the second team to qualify for the rugby World Cup quarter finals after they beat Georgia 43-10 at the at Millennium Stadium in Cardiff. All Black winger Julian Savea scored a hat-trick of tries but on the whole the New Zealand side were unimpressive in comparison to the minnows Georgia. Although the win confirmed the All Blacks quarter-final berth with one pool game against Tonga remaining, alarm bells would be ringing in the defending champions’ camp. 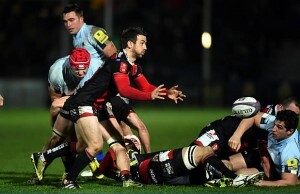 In the bruising Pool C match at Millennium Stadium they outscored Georgia seven tries to one. However, the lop-sided scoreline did a disservice to Georgia who physically matched the world champions, forcing them into elementary errors. Georgia’s tough tackling hero Mamuka Gorgodze got the biggest cheer of the night in the Millennium Stadium when he was named man-of-the match. Lost lineouts and scrums, passes fired into empty spaces and penalties not finding touch, showed the All Blacks were well out of tune with only one game left before the knockout stages. Captain Richie McCaw said he saw no immediate reason to worry however. “I actually think we were trying a bit too hard at times rather than taking another tackle and playing through another phase. It is something we have to work on,” said McCaw who came off in the second half but said the leg injury suffered was not serious. “We created a lot of opportunities and were only a pass away. We don’t need to panic too much,” he added. Starting their top available side against a Georgia team resting many of their top players, the All Blacks were expected to win comfortably but instead only led 22-10 at half-time before adding three further tries in the second half. They were rattled by a Georgia team that had little in their armoury but bone-jarring tackles and a powerful forward pack and they used both to good advantage. Their tireless figurehead Mamuka Gorgodza caused constant trouble. McCaw, who limped off in the second half with a calf injury, had called for a big step up after rust showed against Argentinan and Namibia. Instead, he led a side beset by handling errors and wayward passes, and a pack beaten in close-quarter play. 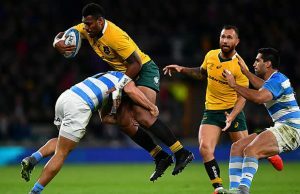 With his first touch of the ball in his comeback game after a leg fracture in his maiden Test three months ago, Waisake Naholo’s speed wrong-footed the Georgian defence and he raced 55 metres to score. Waisake Naholo set the game alight with a 55-metre run for the line with his first touch of the ball. But it was not a flawless performance for the try-scoring specialist in his comeback game after suffering a leg fracture in his maiden Test three months ago. Any thoughts of a stunning, runaway win were soon erased when Naholo lost the ball with his second touch and Georgia cashed in on their turnover luck. Fullback Tsuklauri toed ahead and won the race for the ball to score under the posts. Lasha Malaguradze levelled the scores with the conversion and landed a 49-metre penalty to keep Georgia in touch at 12-10 after Savea had scored the All Blacks second try. The early pace of the game appeared to be telling on Georgia and the defence cover was no where to be seen when Savea scored his second in a standard backline move from a scrum. Dane Coles secured the bonus point fourth try in the 22nd minute dotting down wide out just as Savea had done twice before him with Carter missing all three sideline conversion attempts. As the errors kept mounting, and Naholo was twice forced out in the corner, the New Zealanders went 30 minutes before they scored again. From a long build up they eventually cracked the Georgian defence with Brodie Retallick crashing over and Carter added the extras. As the Georgians faded in he closing minutes Savea and Malakai Fekitoa added two further tries with Carter landing the extras. Ben Smith; Waisake Nadolo, Conrad Smith, Sonny Bill Williams, Julian Savea; Dan Carter, Aaron Smith; Kieran Read, Richie McCaw (capt), Jerome Kaino; Sam Whitelock, Brodie Retallick; Charlie Faumuina, Dane Coles, Wyatt Crockett. Beka Tsuklauri; Giorgi Aptsiauri, David Kacharava, Tamaz Mchedlidze, Alexandr Todua; Lasha Malaguradze, Giorgi Begadze; Lasha Lomidze, Mamuka Gorgodze (capt), Shalva Sutiashvili; Levan Datunashvili, Giorgi Chkhaidze; Levan Chilachava, Shalva Mamukashvili, Karlen Asieshvili. Replacements: Simon Maisuradze, Mikhail Nariashvili, Anton Peikrishvili, Kote Mikautadze, Viktor Kolelishvili, Vasil Lobjanidze, Merab Sharikadze, Muraz Giorgadze.